← New CTO, new Linux focus for HP? In any case, I’ve wanted to visit Iceland for quite some time. No great or wonderful reason underpinned this feeling, it just seemed like a good thing to do. And so my wife and I signed up for a package and found ourselves in Dublin Airport anticipating an enjoyable trip. Alas, after spending 48 minutes in a security queue that featured people taking all sorts of short cuts in an attempt to make their flights, I wasn’t so sure that it was a good idea. The Dublin Airport Authority exhibited all the management credentials that I have seen in small airports in India in terms of their ability to conduct security checks and seeing that this happened in the “old” Terminal 1 rather than the brand-new Terminal 2, some suspicion passed through my mind that the cost-cutting approach of Terminal 1’s major tenant (Ryanair) had influenced the lack of staff, control, and throughput. However, this couldn’t be true because Ryanair is ultra-efficient when it comes to doing things in time, even if it insists on informing you of its success in landing on time with a very annoying trumpet call. The IcelandAir flight was just fine and landed on time in Keflavík Airport (KEF), some 40km away from Reykjavík, the location of our hotel. Bus transport was arranged as part of the package and we were ushered out by some guides, all of whom were determinedly cheerful in the pursuit of the schedule laid out on their clipboards. We ended up at the Reykjavík Natura Hotel, owned by IcelandAir and part of their HQ complex. 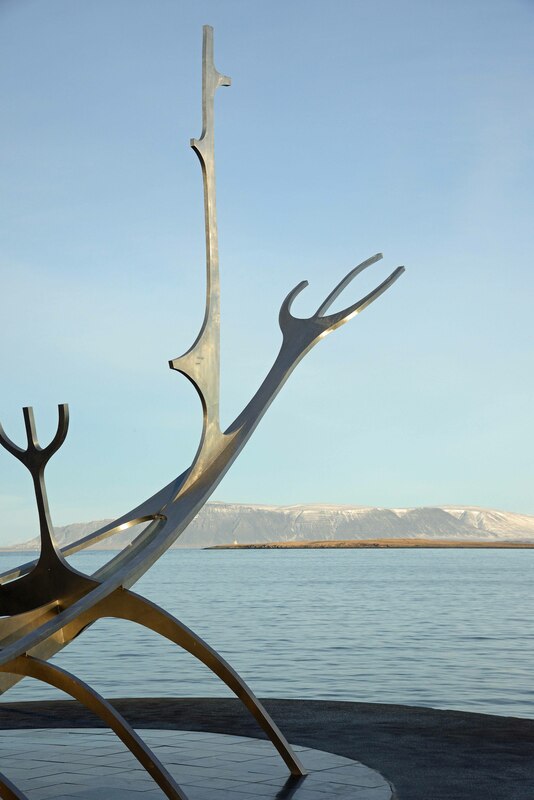 The hotel was some 2km out of the city center and positioned alongside Reykjavík’s domestic airport. All I can say about the hotel is that it was adequate and that the pictures on its web site were not reflected in the accommodation. Our room was small but clean and containing nothing that would make you want to stay in it for any length of time. The restaurant and other facilities were just OK. I guess it was fine for three nights, but if I return to Iceland, I definitely won’t be staying at the Natura. However, you don’t go to Iceland to do hotel reviews. 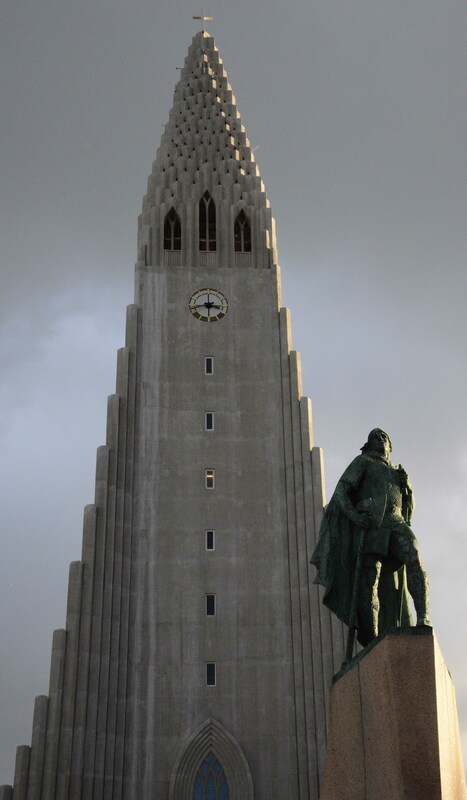 We quickly left to walk downtown and explore what Reykjavik had to offer. The answer is that the city is compact so the center is easy to get around. A good variety of restaurants and shops are available, so it’s easy to spend a few hours mooching around and then find something good to eat. The next day we awoke to 100kph winds with gusts to 150kph. All tours had been cancelled because the combination of high winds and narrow Icelandic roads made tour buses dangerous. The prospect of going on a guided tour had seemed both limiting and expensive to me, so I had booked a car with Avis (using AutoEurope.com to get an excellent rate). Unfortunately the nearest Avis office was at the domestic airport, so I had a 25 minute trek against the wind to get there. Once at the airport, the very nice Avis representative upgraded our car to a Land Rover Discovery, probably because I was one of the few customers they had seen that day. Equipped with one of the world’s best off-road vehicles, we set off to Thingvellir national park, about 50km away. Apart from the wind and the ten-degree wind chill factor that made the zero degree C temperature a tad cutting, the weather wasn’t too bad until we got to the park. At this point, the wind really started to blow snow into our face – and whipped my glasses off and under a table about 7m away, which took some searching to find. Given the weather, there wasn’t really too much to see so we set off again to head towards Geysir. I admit that attempting to see a geyser in the kind of conditions that existed seems a little mad, but we were out and about and wanted to see the country. Fortunately, the weather deteriorated close to a white-out due to drifting snow and we turned back to the city, stopping to admire the effect of the wind on Lake Thingvellir. 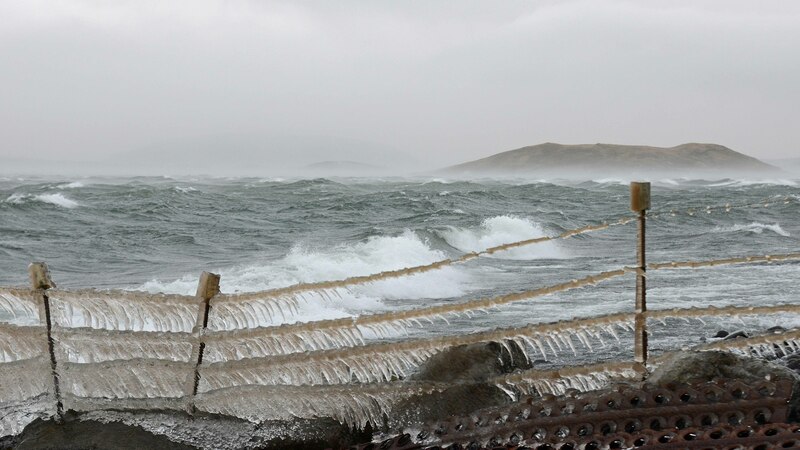 The wind still blew on the following day but it wasn’t anywhere close to as bad. Off the dedicated explorers went again in an attempt to see more of Iceland, heading across the amazing lava fields to Krýsuvík. Our route took us across some amazing countryside over a gravel road, which we hand’t quite expected to encounter. A number of 4x4s equipped with some amazingly large tyres passed us along the road – they clearly knew where they were going and we were ambling along, gaping at the view. The hot springs, mud pots, and other geothermal activity at Krýsuvík comes along almost as a surprise. A small sign on the side of the road indicates that something might be seen if you follow a track towards the wisps of steam that can be seen rising. This leads to a couple of wooden cabins that probably sell souvenirs and food at busier times of the year, but then you’re on your own to walk around the places where the earth belches hot air and foul gases. I imagine that such a setting would be impossible elsewhere in the world where insurance liabilities preoccupy the guardians of natural sites. 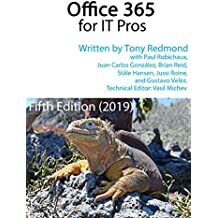 Sensibly, the Icelanders seem to have taken the view that if you play with the kind of hot water and steam emitting from the earth, you accept the consequences whether in the form of a nice hot shower or a scalding burn. 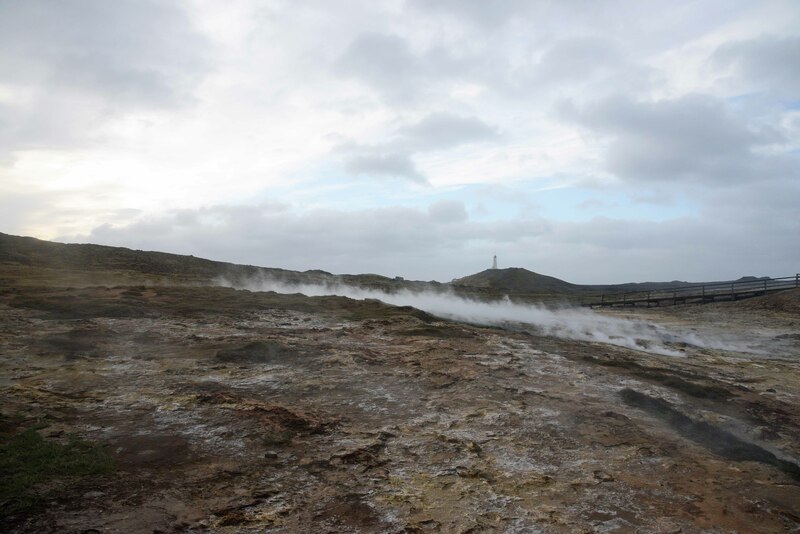 There’s a limit to the amount of time that you can spend looking at hot water and steam, even if it comes with a sulfurous stench, so off we went again to see what could be found in the rest of the Reykjanes peninsula. Truthfully, there’s not too much to be seen in Reykjanes unless you visit the delights of the Blue Lagoon, a tourist trap that every tour organizer in Iceland seems to want people to visit (possibly because of the high fees they earn by directing traffic there). It’s a perfectly nice place to drive through, unless you’re easily bored by lava fields and slow-paced fishing villages that make even slow-paced Irish farming villages look like hotspots of activity. 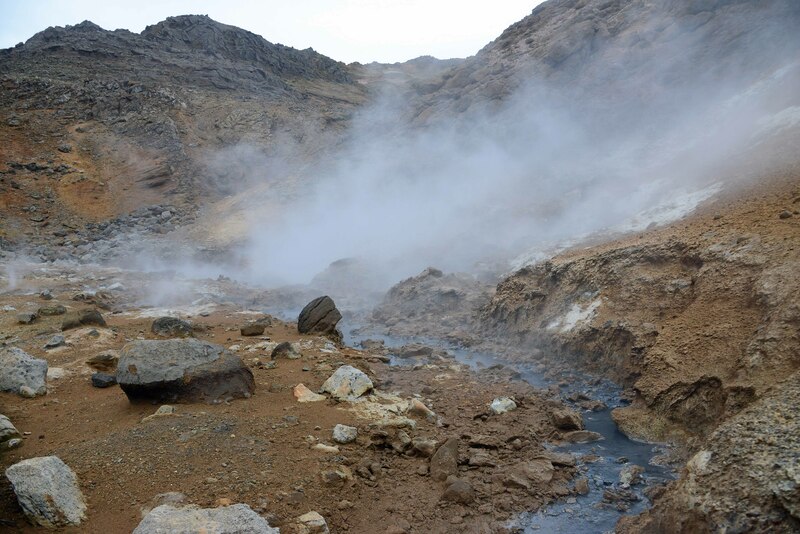 More thermal activity can be seen, including the way that the energy from the hot springs is captured at Svartsengi so that it can be used to heat houses (I quite like the photo below and it’s now serving as my Windows 8 desktop background). Apparently, most of the heating in Iceland comes from geothermal sources and they use very little oil or gas for this purpose. 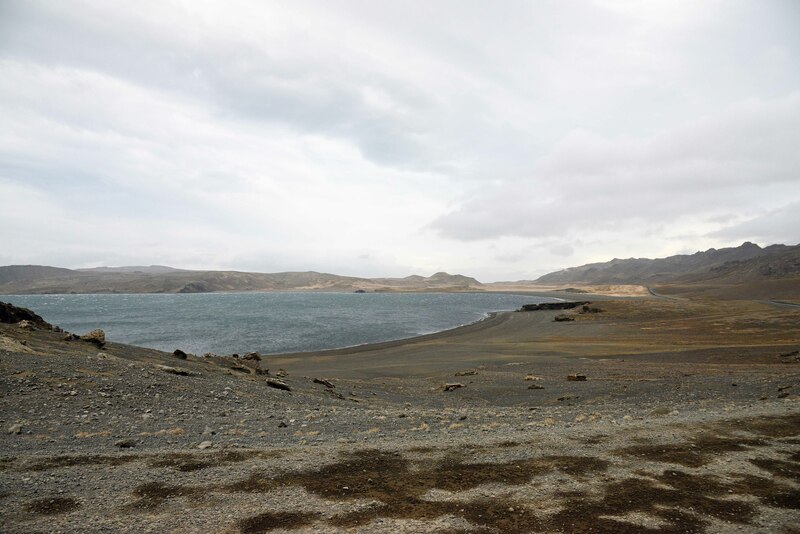 The capture is so efficient that the temperature of the water captured declines by only 2 degrees Celsius as it travels by pipeline to Reykjavík, or so the guidebook said. Speed limits in Iceland are quite low (90 kph maximum) and although there’s not a lot of other traffic, covering ground takes more time than you’d expect.We paused at the spot where geologists have determined that the European and American plates meet (I doubt that Disney will seek to include this in any theme park soon) and made our way back to the city. 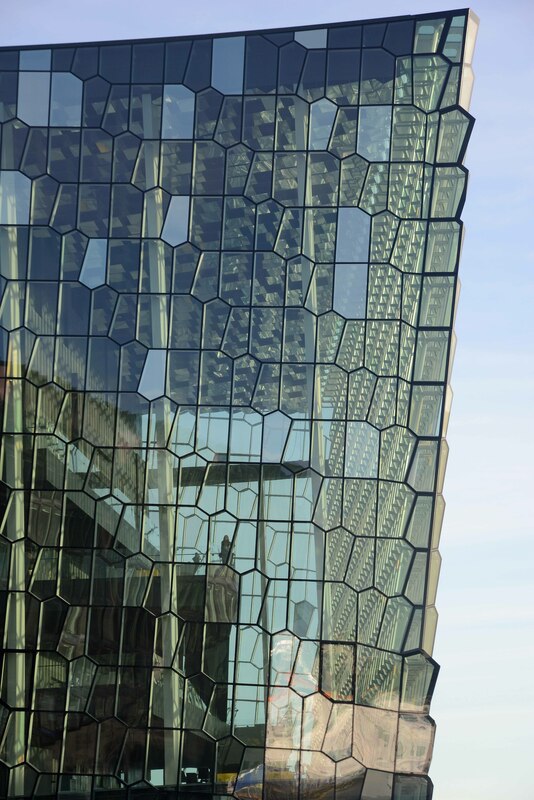 Our final day allowed some time to have a walk on Reykjavik’s seaside promenade and around the city’s opera house. The storm over the previous few days had thrown up plenty of seaweed and stones onto the promenade but that didn’t stop lots of people enjoying the bright winter sunshine. It was a nice way to finish up our trip to Iceland before driving back to the airport for an afternoon flight home. Three days isn’t enough to get to know a country, even one that’s as small as Iceland. I would like to return, probably in summer, and take the time to travel to other parts of the island, including the more isolated parts in the north and east. I’m sure that better weather and more time will make an Icelandic trip a much more enjoyable experience all round! This entry was posted in Travel and tagged Iceland, Icelandair, Krýsuvík, Natura Hotel, Reykjanes, Reykjavík, Thingvellir. Bookmark the permalink. Excellent write up and photos. Meanwhile, we drove around in a Toyota Land Cruiser, and even though I’m a Brit I might take issue with your suggestion that your Land Rover is the best vehicle in that class! We drove across the middle where gravel roads are a luxury, and river crossings frequent, one of which convinced me that the Land Cruiser was certainly up to the task as the water came half way up the doors. It’s a fantastic place and I suggest you do go back. PS For Geeks, it’s possible to take a tour of the geothermal power station (the only place I have ever visited that has a graph on the wall of the station’s [variable] height above sea level each day…) and on the basis that I was an hp employee (then) and they had some hp computers on view I managed to busk my way actually inside the station. Thanks Graham. All comments duly noted and I shall go back… and a Land Cruiser seems to be pretty popular on Icelandic roads so I assume that it’s a good choice for the terrain!